Undoubtedly, one of the best things about Christmas Day is the food, the booze and the fact calories don't count. And nothing, nothing kicks off Christmas day right like a good, mouthwatering plate of deliciousness first thing in the morning. From dark chocolate avocado mousse (with warm caramelised bananas) to crispy hash brown breakfast skillets, these are the last-minute breakfast ideas you need in your kitchen recipe file. Classic, devour-worthy and posh enough to impress your family members on Christmas morning. Here's how to do it yourself. PS, one is never enough! If you want something delicious but won't compromise your waist line, this is the one for you. Silky smooth avocado mousse with warm caramelised bananas. Yummm. Here's how to make it in just minutes! Christmas is the perfect excuse for red velvet anything! Get the recipe. A massive pastry ring loaded with bacon, cheese and eggs. This is why breakfast is the best meal of the day people. Here's how to make it yourself. The perfect light morning treat just before opening pressies! Get the recipe. Stuffed French toast with cream cheese, fruit, and whatever else you can fit in there (Nutella anyone?) Here's how to make them. Who said gluten free was boring? Shredded hash browns, peppers, bacon, and eggs in warm melty cheese. If you're a spicy lover like us add a bit of chilli for an extra kick! Get the recipe. The Queen of French toast. This is seriously too good to pass up. Here's how to make sure you don't miss out. A breakfast hybrid of frittatas and waffles. So you never have to go without eggs and waffles AGAIN! Get the recipe. Cinnamon is one of our all time favourite holiday ingredients so when we saw this giant cinnamon roll cake we couldn't help but including it. Get the recipe. 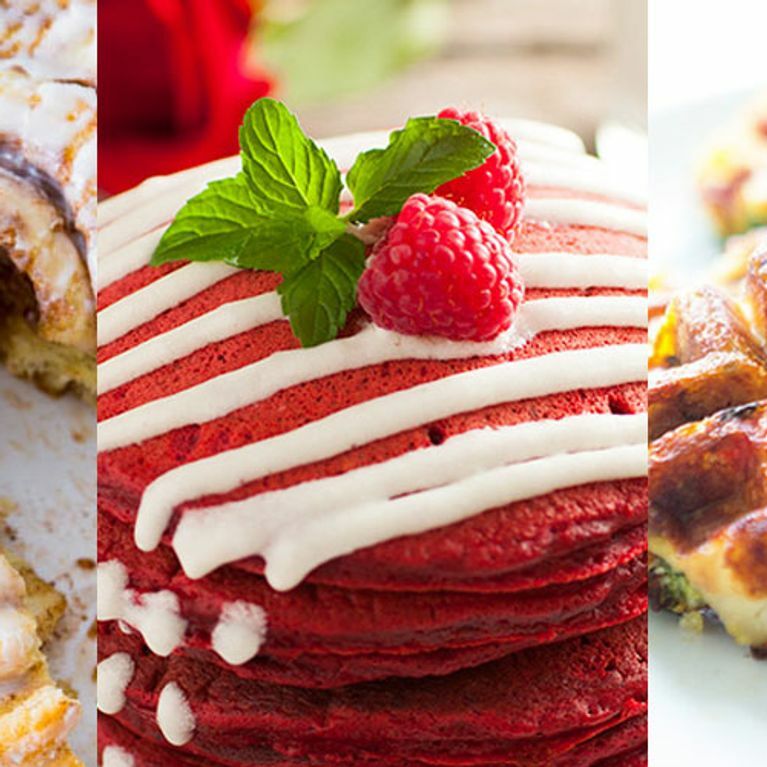 What are you whipping up Christmas morning? Tweet us @sofeminineUK!